PDF (but you can buy the Kindle Edition), 31 pg. Hagit Oron has branched off from her adventures with Elphie to come up with something for slightly older readers. This is the story of Bear, a young man in search of a pet. He has a few hurdles — his parents (his mother in particular), his sister’s qualms about several representatives of the animal kingdom, and reality (he doesn’t ask for a Hippopotamus for Christmas or anything that outlandish, but it wouldn’t have surprised me). I really liked the siblings relationship as depicted here — it felt real, it felt relatable. I’m not sure that I buy the 6-9 age range for this story — but I’m not an expert, 5-7 would be my guess. But whatever, target ages like that are best used (and/or ignored) by those who know the kid best. The thing that will appeal most to older readers is that if you click an icon in the lower corner of the page, it’ll take you to another page that gives you some insight into the factual basis behind the part of the story you just read — or showing just how fictional it was. 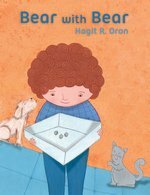 Oron drew from her own family’s pet hunt for inspiration and she details how she went about taking that inspiration and turning it into the story. It’s an added touch that I think could really help a lot of younger readers. Now, my review copy didn’t have that function, so I can’t tell you how well it worked — I assume it’s pretty straightforward in operation — but I did get to read those pages, and appreciated what Oron was trying to accomplish with them. Armeland’s art pops off the page. It’s simple and attractive, but it feels like there’s something wrong with calling it “simple” — I don’t mean it as an insult, it’s the first word that comes to mind. But there’s a lot of subtle things going on with the illustrations, too — so it’s not simplistic. Ugh, I clearly shouldn’t talk about art — I liked it, I thought it fit the story, and it didn’t feel like the art in kids’ books that I’ve seen a million times before. It was a nice story, told in a good way that should appeal to younger readers — with a nice twist that’ll capture the imagination of many. Maybe even inspire some young writers out there, now that they’ve seen how their lives can be the basis of fiction. I continue to be a Oron fan, probably more of one now than before. Disclaimer: I received this book from the author in exchange for my honest take, and I thank her for it.